WAP stands for Wireless Access Protocol, and is more commonly referred to as "Mobile Internet"
Most of today's mobile phones, smartphones and PDAs come with a built in WAP browser. With a WAP browser, you can access dedicated WAP pages while on the move. As WAP phones have smaller screens, content is often fairly basic, so pages are quite efficient and downloaded fairly quickly. WAP is supplied as a service by most mobile phone operators. 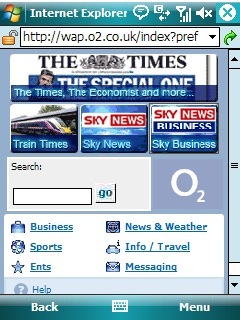 When WAP launched, it was available from browsers that dialled up a special WAP number. Today, WAP access is available over GPRS, allowing faster browsing via an always-on connection. With GPRS, you are billed by the amount of data you send. Some UK operators, notably o2 online, offer an inclusive GPRS WAP allowance. Once your mobile it set up correctly, you need to go to your network operator's WAP homepage to access WAP content. Not really. For a start, some operators give you free WAP. Most well known for free WAP access is O2 online (inclusive GPRS WAP allowance with most tariffs). For more details of WAP access and free text messages from o2, see our o2 page. Also, WAP content is optimised for use on a mobile phone - so it's not cluttered with Java, large images, or banner ads. With standard dial-up, you pay by the minute to access WAP, and with GPRS, you pay for the amount of data you download. As WAP is optimised, the costs for either method are fairly low. News headlines - Your WAP provider normally provides a link to a news service from its homepage. Access news, sport and financial headlines from the homepage of your WAP provider to stay up-to-date on the move. When WAP started, you could only access pages (known as 'decks') that had been specifically written for WAP phones. This meant that the amount of information available was quite limited. Fortunately, things have changed, and not only is there a lot more content available as sites have found it easier to make their existing content WAP-friendly, but with this great tip, you can access just about any web page over WAP. Google has make their hugely popular search engine available over WAP - you can search for Web as well as WAP content from a WAP browser, and Google's 'proxy server' does an impressive job of converting standard web content to WAP. To try this out, from your phone's WAP browser enter the following address: http://www.google.com/ and when you get to the search page, enter a clue that will find the page you're after. Select Search, and you should see a WAP version of the page you're after. True, mobile phone screen's are pretty small - but that's what people want. If you want full-screen Internet surfing, then you'd be lugging a laptop around with you. WAP user's aren't expected to be sitting in front of a phone for hours. WAP is about fast no-frills access to important text on the move. WAP has no email Chances are, your mobile phone operator provides you with email access over WAP. O2 online provide their customers with an email account that can be accessed via applications like Outlook, over the web, or from a WAP phone. Another company that provides Web, WAP and text message email is BT Yahoo (formerly BT Openworld / BT Internet). See our BT Yahoo page. Bearer type: There are two types: GSM or GPRS. GSM works by dialling a dedicated WAP dial-up number and should work on any WAP-enabled handset. GPRS is a newer technology, and only works on selected handsets. GPRS is an always-on service that is billed per-kilobyte, and not as GSM, which is billed per-minute. Gateway IP details - WAP works by routing traffic through a Gateway that handles optimising the content efficiently. The address is made up of a series numbers separated by dots. This may also be referred to as the WAP Proxy Server address. This site has pages dedicated to setting up o2 on a selection of smartphones and PDAs. Select a link from the side menu for details of configuring o2. For more information on o2 WAP, go to our dedicated o2 Wap page. Looking for low-price mobile Internet access? Q. I have free WAP from o2 / (BTCellnet / Genie) running on my Psion. Can I use this free connection to surf? Q. I'm having problems connecting. What do you advise? Data services have to be enabled by your Network Operator. If you can't connect, contact your network operator (e.g. o2, Orange, Vodafone), and ask them to ensure that your SIM card is 'data-enabled'. If trying to connect via GPRS, note that this is a different service to standard dial-up data access. Again, contact your network operator to ensure GPRS is enabled on your account. Connecting via infrared to your mobile? Ensure distance of between 5 - 15cm (too close may swamp the IR eye). Also, ensure that Infrared is switched on on your mobile, and that there is sufficient signal strength. If you're still having problems, you'll need to contact the network operator for help. Q. Can I access Hotmail over WAP? A. Yes. 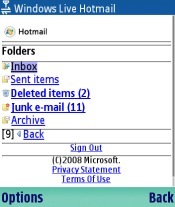 Go to http://mobile.msn.com/ from a Wap browser, then select "Hotmail" from the menu. 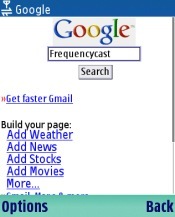 The screenshot to the right demonstrates WAP running on a Nokia Series 60 Wap browser. Go to http://www.hotmail.com/wap and enter your log on name and password. Don't worry when you reach the dead end. Go to http://mobile.msn.com and select MSN Hotmail. You will now get into your Hotmail Inbox! Q. When I try to connect to a secure site, such as banking, I'm told that my phone is not secure enough. A. This could be something to do with the version of WAP that's built-in on the handset - Early versions of WAP handsets didn't have WTLS security included, and this is required by some secure WAP sites. You may want to check the handset manufacturer's site to see if your handset has WTLS, or can be upgraded in some way. Q. I get a message "Message from WAP: Sorry ,you've used the maximum amount of data allowed today." This would indicate that you have used up your daily allowance of data download using WAP. If you're not aware that you've been using WAP, you may have a service running in the background that's trying to connect to WAP, or downloading content in the background. You should be able to disable WAP and Internet access on your handset if you don't want to be using this service.